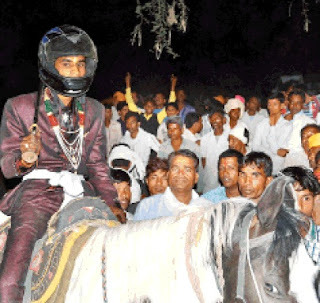 Why this Dalit bridegroom was forced to wear helmet while riding horse in his marriage procession? Do you know why this Dalit man was forced to wear helmet while riding the horse. The young man--Pawan's marriage was fixed with a girl in Negrun village in Ratlam district of Madhya Pradesh. 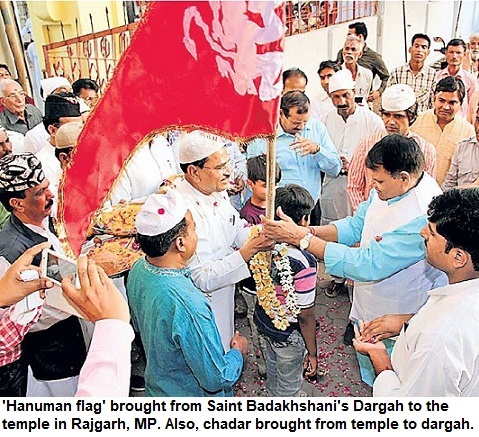 However, as he belongs to the Scheduled Caste (SC), the local dominant upper caste communities opposed that a Dalit would ride horse in the baraat. As per the local tradition, Dalits are still not entitled to ride horse in the 'baraat'. However, when the baraat came, despite opposition, there was stone pelting at the girl's house and also at the 'baraat'. The local government officials made him wear the helmet so that he didn't get hit. However, officials including a naib-tehsildar was also injured in the stone pelting. The marriage rituals were later solemnised. The police later swung into action. Over two dozen villagers who opposed the Dalit riding a horse, and resorted to stone pelting, were booked. The sections meant for atrocities against SC/ST, were also applied. Such opposition to Dalits are common in Bundelkhand, Chambal and Malwa regions of MP. In rural areas, upper castes still feel that 'lower caste' grooms have no right to ride a horse. 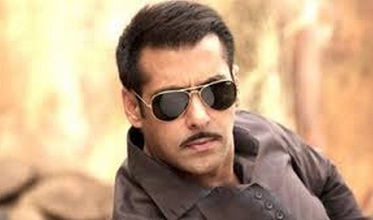 Bollywood superstar, Salman Khan, has been sentenced to five years in the hit-and-run case that took place in 2002. Despite all the resources, his celebrity status and top lawyers on his side, Khan has been awarded the jail term. Though he can go to higher courts, right now he will have to go to jail. Let's have a look at the various aspects of the case. 1. Generally, hit-and-run cases have bad rate of conviction and jail terms are short. Under the Indian Penal Code (IPC), the law is not harsh on the errant motorist and the person gets instant bail from the police station (no need to go to court). 2. Under section 304 (A), which is generally used in case of hit-and-run cases, maximum punishment is TWO years. In case of Salman Khan, section 304 II (culpable homicide) was applied. This was apparently because it was a 'high-profile case'. So a VIP is more likely to face the law, is it? 3. 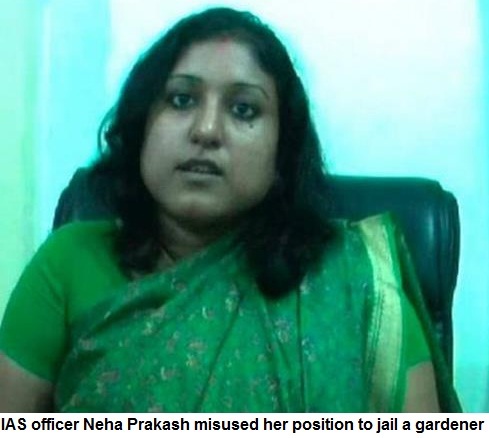 One must give credit to Mumbai police, which had registered this case, for some professionalism. Else, it is commonly known how elsewhere in India, FIRs are filed carelessly and case prepared in such a way that they don't stand in the court. Forget, how the person's drunken status, gets reflected in the medical report. It is rare to see a person getting charged for drunk driving and, even rare that he gets convicted for it. It may be because of lackadaisical attitude of policemen during medical examination, and preparing a shoddy report. But, in this case, Khan's blood sample was taken for ascertaining drunken status. Sorry to say, but it is a fact, that in most other states, it is nearly impossible to imagine a celebrity getting hauled to this stage in a case of accidental death. Even if there is a conviction, it would be of 2 yrs under 304 A, and a suspended sentence means, no jail. 4. When there is a poor 'system' [shoddy investigation, cops functioning as per the doctrine 'show me the man and I will show you the rule' and delay in courts], there will be instances when a VIP gets away easily, and also situation when a VIP faces too much scrutiny and gets harsh punishment just because of his status. 5. It is good that a celebrity gets punished for an offence. You can't kill a person by mowing him down with your vehicle and then expect, you will walk away, freely. Generally, lot of people get away with light sentence or get acquitted but if there is punishment, it should be welcomed. In fact, everyone who kills people in road mishaps, should get similar and exemplary punishment. 6. The law needs amendment, drastically. Road mishaps are the biggest killers in India. A man hits to death, children, and gets bail instantly, without even going to the court. Section 304 (A) is used in case of 'rash driving', which is termed as "negligence causing death''. 7. Salman Khan has a huge fan following. BeingHuman initiative is praiseworthy. This has earned him more support. But a wrongdoing in past can't be undone by it. His good deeds surely bring him support and love. Is that less? To expect that it would help him in his past criminal case, is unjustified. 8. There is an argument that celebrities have it easy in this country. Also, on the other hand, there is greater pressure on courts in such cases. Still, VIPs get support in many ways. Sanjay Dutt's case is testimony to the fact that despite his involvement in such a serious case, he got political backing and later also, he was released on parole repeatedly. Even, the TADA charges were dropped. 9. In India, politicians have got away easily in cases of mass killings and often got jailed on cases that were just hyped and there was no strong evidence against them. No wonder, people say, that your fate depends on luck. When there is a crumbling system, what else you can bank upon, expect luck! 10. One just hopes that with increasing focus on the need to punish people for their bad deeds, irrespective of their VIP status, the courts would deliver justice in cases of massacres and mass killings too. There are riots in Assam, UP and many other states in which hundreds get killed but there is no conviction. Hashimpura is the latest example. One hate preacher gets arrested and jailed for a while, but the other who has been involved in inciting violence for decades, has never been arrested for a day. In fact, cases are filed but, later state governments withdraw them. Courts also don't take cognisance of the miscarriage of justice. Still, we must not lose hope.